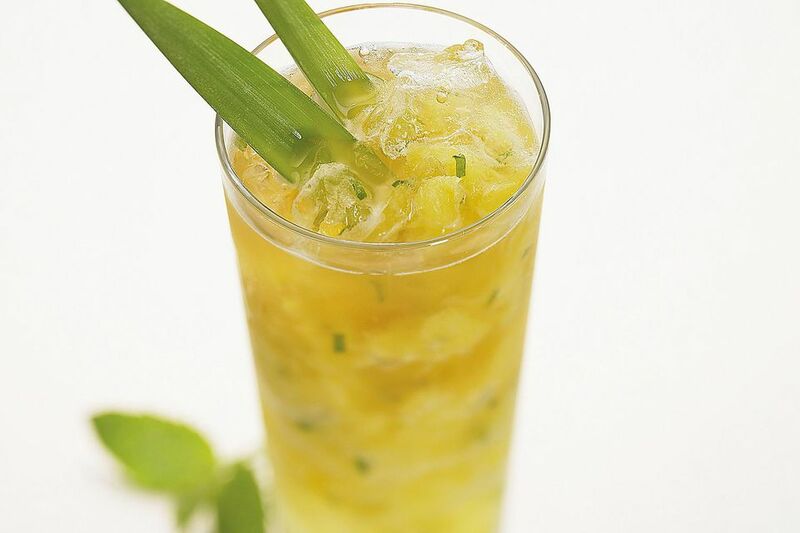 A fun and fresh cocktail, the Pineapple Mojito takes everything that we love about the time-tested and popular Mojito and adds the sweet, tropical taste of pineapple. It is both delicious and easy to mix up. This recipe is the brainchild of Martin Sadlemire at the Wequassett Resort in Chatham, Massachusetts. In it, Sadlemire adds both fresh pineapple and pineapple juice, giving it a tart and fresh tropical taste that is backed up by a fine aged rum from Brugal. From a Mojito lover's perspective, this is a fantastic rendition. It's also very easy to offer guests the option of the original recipe, this pineapple version, or any other fruit Mojito. How Strong Is the Pineapple Mojito? Brugal Añejo Rum is an 80-proof rum and if you make this mojito as the recipe states, you can expect it to be around 20 percent ABV (40 proof). Brugal is certainly a rum that you should know. The distillery produces a nice line of aged rums that are smooth, affordable, and worthy of any rum-based cocktail. If you're ready to step up your rum game, let me introduce you to Brugal. The Brugal Rum distillery is located in the Dominican Republic. It was founded in 1888 by Don Andres Brugal Montaner and is run today by the fifth generation of the family. This family connection is so important to Brugal that only family members can be the 'Maestro Ronero' (master rum makers) at the distillery. Brugal also has a few family secrets that go into their rum production and they are masters at barrel selection. And, it is in the aging where Brugal really does stand apart in the rum world. Their flagship bottle is not a white rum, but an añejo and if the core of a line is aged, you know to expect great things. Brugal Añejo Superior Rum - Aged for up to five years in American oak casks that once housed bourbon. It is an ideal aged rum for any cocktail. Brugal Especial Extra Dry Rum - Crystal clear, this rum is actually aged from 2-5 years in the same American white oak but it is also triple filtered. Interestingly, it's a dry rum which we don't see much so it has a great appeal for a variety of drinkers. Brugal Extra Viejo Rum - A Cognac-like rum, this one can be mixed or sipped. It is aged for up to eight years in a very fine-tuned selection of oak casks. Brugal XV Rum - A blended rum, you will find this to be a dry rum with the slight sweetness of sherry. It is a combination of rum aged 3-8 years in American oak and rum aged 2-3 years in Pedro Ximenez sherry casks. Brugal 1888 Rum - Double aging is the feature of this rum, which gets it's name from the brand's founding year. This rum first rests for eight years in American oak before moving into European first-fill sherry oak casks for another six years. Brugal Papa Andres - A limited edition bottle from a rum that has been enjoyed by the family for five generations. The 2015 Alegria was a blend from three very rare casks and bottles sold for a reported $1500. That is a very luxurious price in the rum world.